Welcome to the final day of our celebration of World Breastfeeding Week! Earlier this week, we discussed the health benefits to mother and infant of breastfeeding, the needs of HIV positive mothers who are breastfeeding, and HAI’s work around maternal and infant health in Timor Leste. Yesterday, we explored why more women aren’t breastfeeding and took a look at the aggressive marketing practices of formula companies. 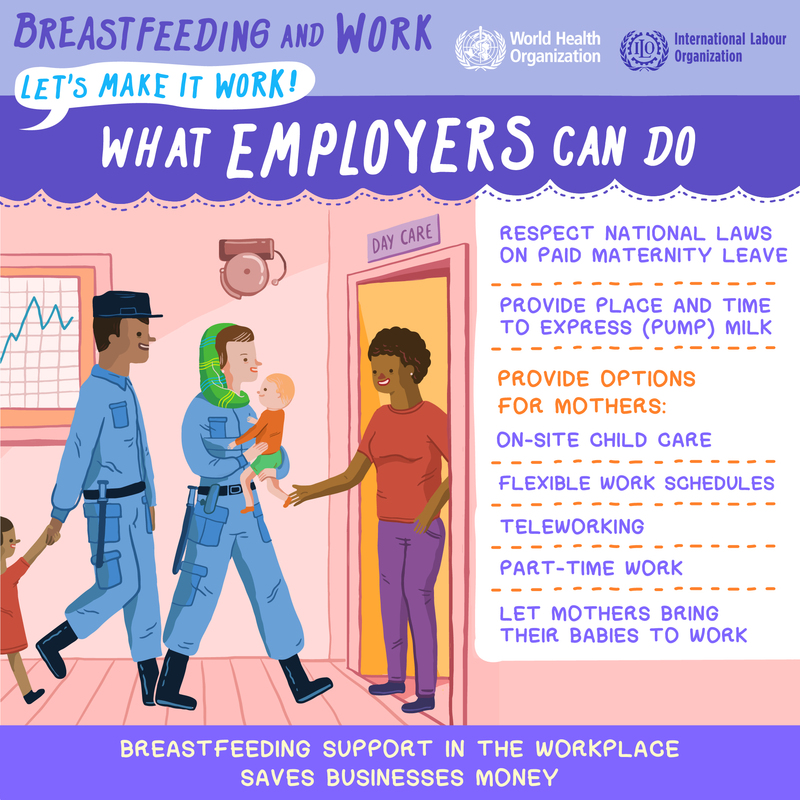 Ask any new mom, and she’ll tell you that breastfeeding is hard work – but what about when it’s time to return to the workplace? Even if a mother prefers to breastfeed and successfully initiates breastfeeding her child, returning to work will certainly make it difficult to follow the recommendation to exclusively breastfeed infants for the first six months of life. Only 10% of working mothers breastfeed, less than a third of the rate of mothers who do not work. To address some of the challenges that women in the workplace face, the International Labor Organization adopted a Maternity Protection Convention (and updated it in 2000) which recommends 14 weeks’ minimum maternity leave, with at least 2/3 of her previous salary, and the right to more breaks after returning to work to allow for breastfeeding or pumping and a clean private space in which to do so. However many countries, including the United States, fail to guarantee women these protections. In fact, the US is the only one of 38 industrialized countries assessed that fails to meet the Maternity Protection Convention minimum of 14 weeks leave. Many countries also fail to offer the recommended minimum of 2/3 of her salary while a woman is on leave. (Côte d’Ivoire offers 14 weeks at 2/3 pay, Mozambique offers 2 months at 100% pay.) 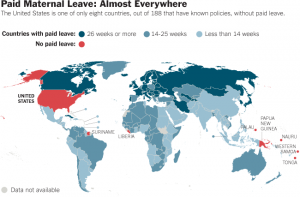 The US does not mandate paid maternity leave. 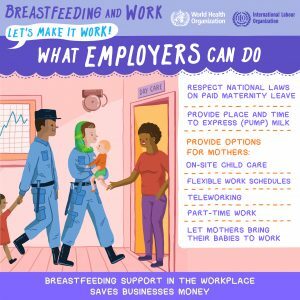 Only a handful of countries offer laws that allow women to stay home from work the entire 6 months’ recommended breastfeeding time (including Sweden, Norway, and the UK). For the rest of the world, new mothers face the challenge of returning to work while they are still breastfeeding. Some women choose to use breast pumps to keep their milk flowing, but finding a private, clean space in which to express milk can be difficult. Lactating woman will stop producing milk if she is unable to express milk regularly. 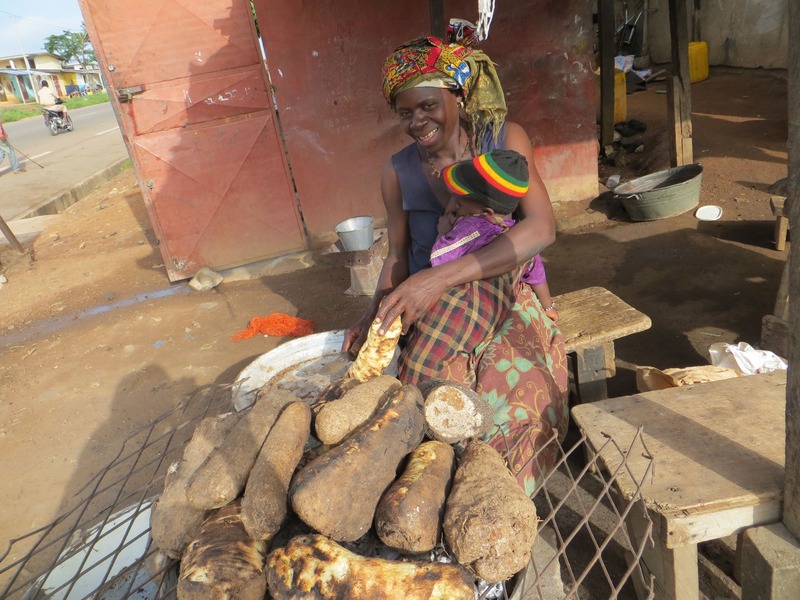 Other women have informal work arrangements in which no support can be monitored. These include domestic and agricultural workers, home workers, those who are self-employed, temporary workers, etc. The International Labor Organization includes these women in its Convention, but in practice the amount of protection that this actually offers women is ambiguous, if not non-existent. In the U.S., the answer could be either. In other places, the answer will be different. These societal pressures around motherhood are not an insignificant factor around the decisions women make for their babies. As we have seen, this can be a particularly complicated issue for HIV positive women. 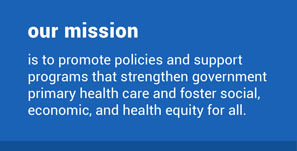 HAI believes that women should be able to make choices for their infants with full information about their options and with the support of their families, workplaces, and communities. In each country where we work, HAI strives to support Ministries of Health and the public sector to create and sustain strong health systems – with enough midwives, nurses, doctors, social workers, and other health professionals – to ensure that moms and babies and people all over the world have access to quality medical services and advice. Did our World Breastfeeding Week blogs give you some food for thought and an insight into HAI’s programs? We’d love to hear from you! Be sure to like our Facebook page and check out our blog often for more information and stories about HAI’s work. Support HAI with a tax-deductible gift! Thank you!